1. Irony is defined as when the opposite of what you expect to happen occurs. Describe the irony of this cartoon. 2. To what news item does this most likely refer? 1. The president is the head of the executive branch of the U.S. federal government. The role of the executive branch/president is to enforce the law. 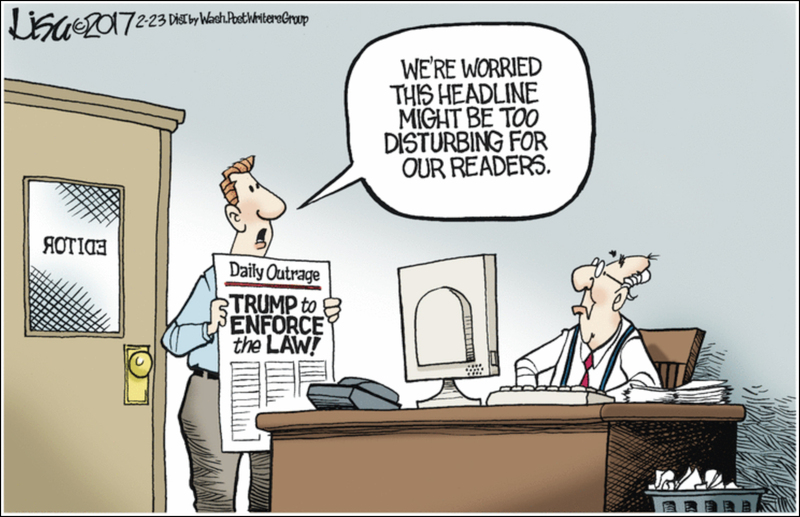 You would expect readers to be disturbed to learn that the president was not enforcing the law. Instead, the reporter is telling his editor they are worried that people will be upset by an article on the President enforcing the law. 2. The cartoonist is referring to President Trump’s executive order directing the head of Homeland Security to implement certain procedures to enforce federal immigration laws. NOTE: The Hill news reported Feb. 21 on a poll they conducted. The poll found that 80 percent of voters say local authorities should have to comply with the law by reporting to federal agents the illegal immigrants they come into contact with.